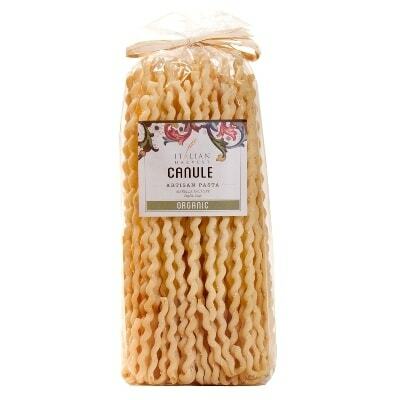 A delectable organic pasta, this pack is from artisan pasta maker Marella, in the Puglia region. Certainly a pretty interesting pasta shape, canule is a long string pasta that looks like an extended corkscrew. With its coil shape, it is great for holding all kinds of yummy pasta sauces. Marella Pasta uses only 100% Italian grains. On top of that, all of their pastas are handmade and undergo a painstaking process of drying. Yes, they dry the pasta at a temperature of only 37 to 38 degrees! A recipient of the 2013 Silver Sofi Award for “Outstanding Product Line”, you will find that Organic Marella Pasta certainly deserves the recognition.